I always have had time for a good ghostly, gothic story in my reading life and Simone St. James is one of the best contemporary practitioners of the genre. She writes stories set in the 1920's and addresses the great upheaval caused by WWI. Jo Manders's husband, Alex, went missing during the war and because he is missing, she is not formally a widow; therefore, not entitled to any benefits. Added to her grief is the fact that she has an insane mother that she must keep in a private institution, keeping her scrambling to keep her head above water. When Alex's aunt, Dottie Forsyth, offers a position as a companion on a European trip, Jo accepts. After all, her mother no longer recognizes her and the job will keep her from the necessity of paying rent for awhile. Dottie is no easy employer, though; grim, demanding and avaricious. Upon returning from Europe Dottie wants her to stay on and go Dottie's home, Wych Elm House. The house is full of discord from Dottie's rakish husband and rumors about the suicide of the daughter of the house three years before. Dottie's son was severely injured in the War as well and does not appear to be recovering. As soon as Jo arrives, she is aware of being watched and has frightening encounters with the daughter's ghost. Can Jo be going mad like her mother before her? And did she know Alex at all? 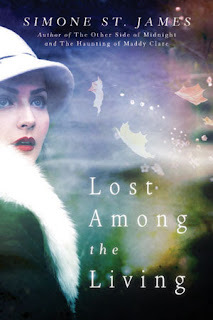 Lost Among the Living is a spooky read with a tender romance at the heart of it. There are two romances, in fact, both with nicely satisfying endings. Thanks to First to Read for an advance digital copy in exchange for an honest review. So, just who is Clara Hudson?